In our prayerful journey through the season of Lent, we remember that the forty days of this time of preparation represent the forty days Jesus spent in the wilderness before entering fully into his ministry. Now in the 21st century, we find this time important as we prepare ourselves for Easter and the celebration of resurrection! Don’t miss the many opportunities to move through this time of preparation and into celebrating Christ anew in our lives. On Sunday, March 20, we will celebrate worship and the penultimate sermon in our series on Jesus’ last week in Jerusalem. This message will focus on the crucifixion story in Mark, how it differs from the other Gospels, and its significance today. As always, our worship services will begin at 9 am and at 10:30 am. Good Friday falls on March 25, where the church will be open from 5 pm to 7:30 pm for an exploration of the meaning of Good Friday for each of us as unique persons of faith. Suitable for persons of all ages and abilities, stations of interactive prayer and learning will be available for participants at an individual pace. On Easter Sunday, March 27, those who are willing to meet the beginning of the new day – experienced by some as a resurrection moment – will gather at Crown Point Park on Mission Bay for a sunrise service beginning at 6 am. For more information and directions, click here. Back at 1561 Thomas Ave, the social hall will open for our annual pancake breakfast at 7:30 am and serving will continue until 10 am. Worship services will take place as usual in the sanctuary at 9 am and 10:30 am. 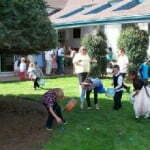 The Easter Egg Hunt for children will begin in the courtyard at 10 am. Easter is a celebration of hope and new life. All are welcome to join in thoughtful reflection, prayer, community, worship, and celebration.